Traveling for business doesn't have to be all work and no play. Smart packing tips and the right carry-on bag can help you get work done faster, giving you a little more time to relax while you're on the road. 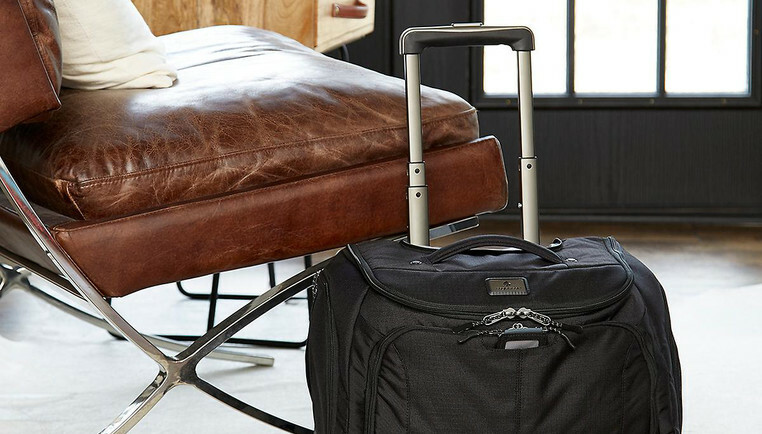 Rolliums or other business carry-ons are a great business travel solution. Not only do they fit in the overhead bin, many feature a padded laptop compartment plus plenty of room for a change of clothes and toiletries! Make sure to take a portable battery charger to keep your laptop, phone and other electronics powered on long flights. Seasoned business travelers know the importance of choosing lightweight luggage and packing to reduce bulk. Clothing organizers, like Pack-It Folders, are a great way to save space in your carry-on and eliminate the need to check a bag. Best of all, they can help you fly through security. Keep your laptop bag or carry-on packed with a few filling snacks. A protein bar or apple can make a huge difference when you're stuck on the tarmac or circling the airport for an extra hour. Whether you're planning a road trip or taking to the skies, a few creature comforts can go a long way to ensuring a pleasant trip. An inflatable pillow and travel blanket make catnaps more comfortable and prevent neck kinks and flattened hairdos. And of course, packing a good book, magazine or a few games can make time fly. If work keeps you on the road, make the use of trunk organizers to keep your business files in order. These heavy-duty bins hold contents upright and keep them from sliding around in your trunk. Best of all, most can be folded down when not in use.